I went on a trip with a bunch of people from a travel group to Virginia for a weekend. 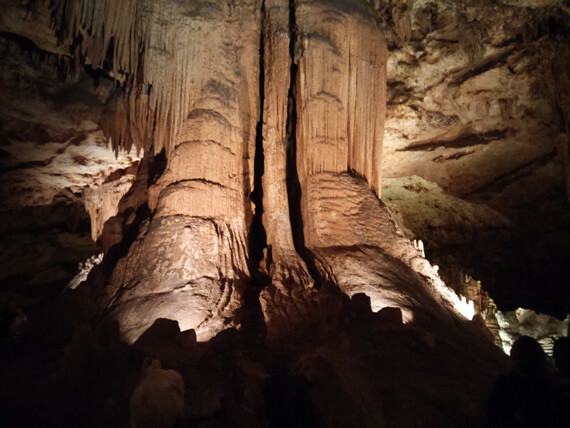 The main destination for this trip was Luray Caverns, which is located in the Shenandoah Valley in the northern part of Virginia. It is one of the largest caverns in the east coast, and a well-known tourist attraction in the area. When we arrived there on a Saturday, the place was very crowded and there were long lines of people waiting to get into the cave. Thankfully the lines moved quickly, so we didn’t have to wait too long. The cave itself was pretty impressive. The whole tour is about one hour, and costs $26 per person at the time I went. 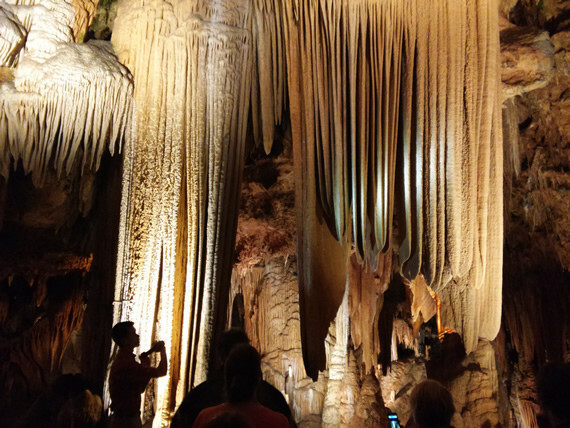 I’ve been to two caves in Upstate NY, and Luray Caverns is much larger. There are some pretty cool looking formations in the cave. My favorites are the pool with the perfect reflection, and the impressive drapery formation which is rated as one of the best in the world, according to our guide. 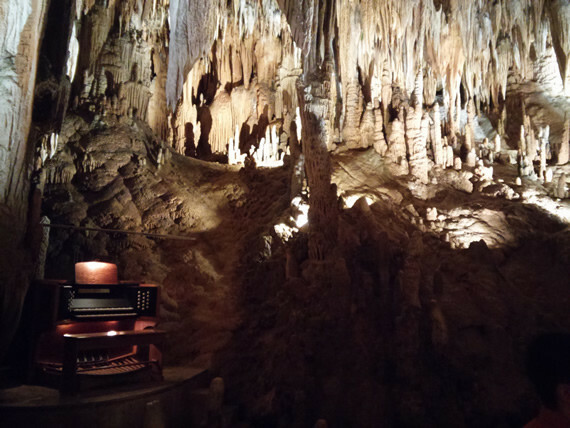 Of course, Luray Caverns is also known for the The Great Stalacpipe Organ, which generates the notes using the stalactites on the ceiling of the cave. We all got to hear a short song from the organ near the end of tour. 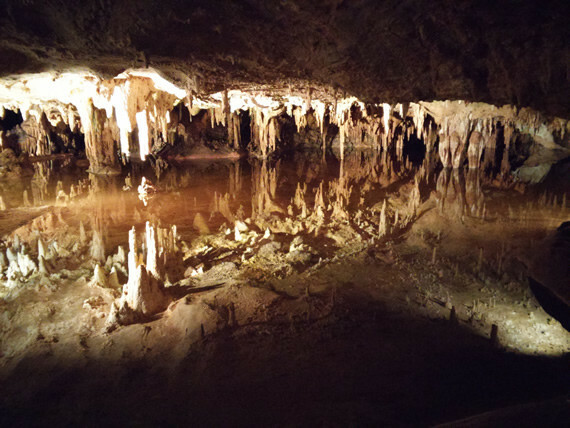 The cavern itself is not the only thing at the Luray Caverns complex. There are two or three small museums along with some other things. 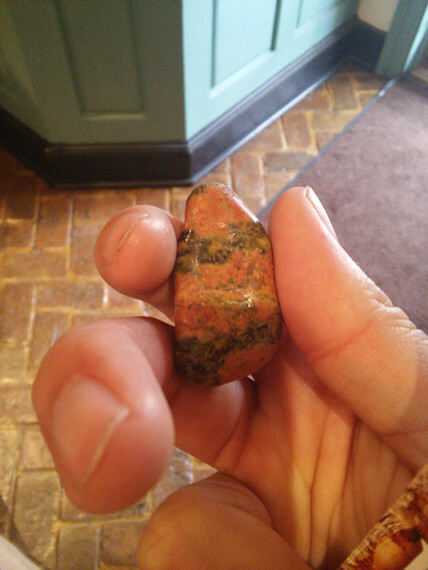 We visited the Luray Valley Museum, mostly because the admission was included in the ticket to the caverns, and you can go the museum to get a free rock, which is a piece of pink and green granite called a unakite. Can’t pass up on a “free” souvenir. 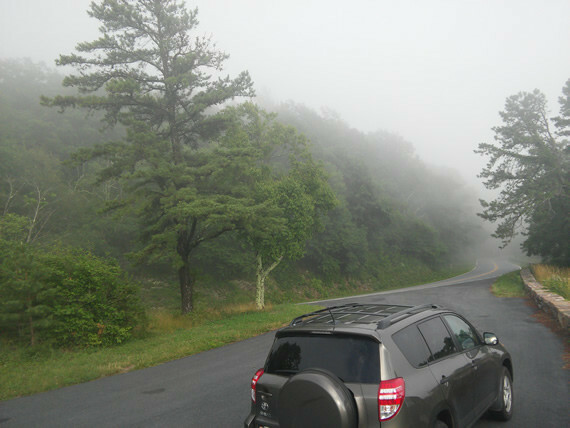 After the visit to Luray Caverns, we visited the nearby Shenandoah National Park. The park covers Virginia’s portion of the Blue Ridge Mountains and is famous for its Skyline Drive, which is a scenic route that passes through the various gaps in the mountains. Given our location, we only drove the southern half of Skyline Drive. The weather was spotty that day and we encountered some fog and rain during the drive, but there were spots where great scenery can be seen. The scenery reminds me of the Great Smoky Mountains (which I visited last year), in that the mountains are covered in lush green forests. The clouds from the unpredictable weather also made for some dramatic panoramas from the scenic overlooks on Skyline Drive. Since we only had a weekend and the weather wasn’t great, we didn’t do any hiking or other outdoor activities at Shenandoah. I might visit this national park again some day. Ideally it’ll be in the fall foliage season, and I can drive up through the Blue Ridge Parkway in NC up to Skyline Drive. 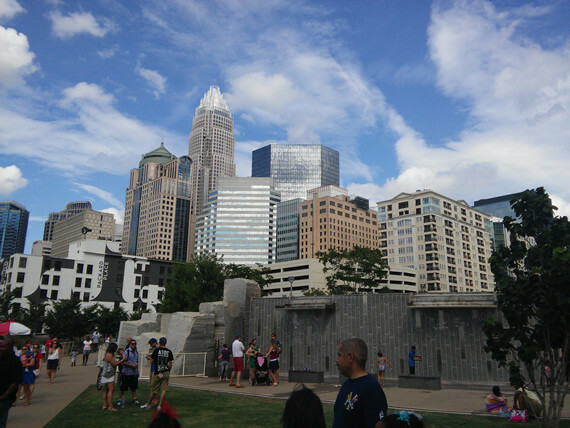 For Independence Day weekend, I visited Charlotte, NC. I was thinking of going to the beach for the long weekend, but changed my mind due to the number of shark attacks off the NC coast during that time. Back to Charlotte: it is the largest city in the state of North Carolina, and is located about 2.5 hours from where I live. 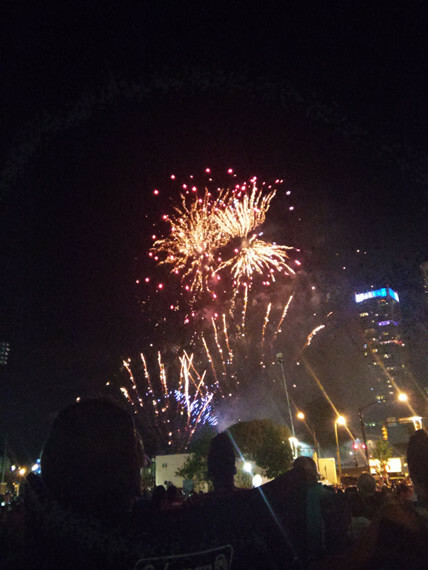 For my trip, I spent the first day walking around downtown and then staying there to watch the July 4th fireworks. Compared to Raleigh, Charlotte’s downtown, which is called Uptown, is a bit bigger, thanks to heavy presence from the financial industry. There are a number of tall skyscrapers and also high-rise condos as well. There wasn’t a whole lot going on during the day on a long weekend though. The great hall area of the HOF. 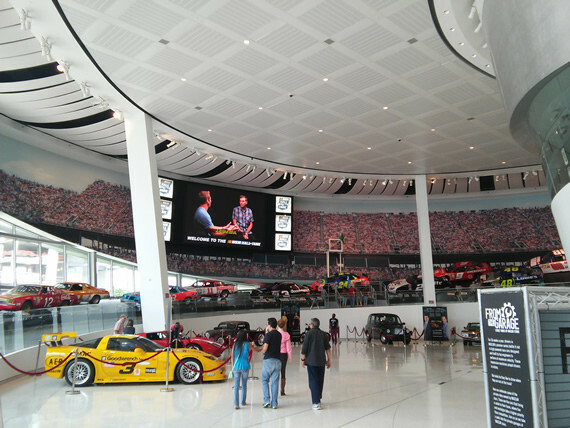 While walking around, I visited the NASCAR Hall of Fame, mostly because it was one of the few museums that were open. I don’t watch NASCAR or any sort of auto racing at all, but I’m at least interested in cars. 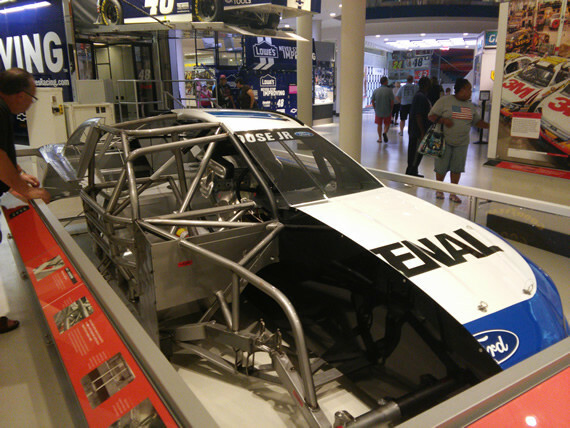 The visit to the NASCAR HOF was interesting and I learned that while NASCAR started out as stock car racing, there is nothing stock about the cars that are used in the highest level of NASCAR today. After dinner time, I went to Romare Bearden Park to wait for the July 4th fireworks, which are launched from the BB&T Ballpark after a baseball game. As the day segued into night, the crowds started showing up and the park was packed by the time the baseball game had finally finished. The fireworks were enjoyable, although I don’t know if it was better the July 4th fireworks I had seen in Albany NY. The part that I didn’t enjoy though was waiting 45 minutes to get out of the parking garage after the fireworks. I should have parked a little further from the fireworks location. The next day, I spent the day shopping. I went to IKEA and the Concord Mills Outlet Mall. I never thought of IKEA as a destination store since there is one in Richmond BC where I grew up, but apparently it’s a big deal, and I’ve heard of people going to Charlotte just to go to IKEA. This IKEA is the only one in the state, with the next closest ones being in Washington DC and Atlanta, GA. I didn’t buy any furniture, but did pick up some household items. I then visited Concord Mills, which is the largest outlet mall in the state. Unlike the usual Premium or Tanger outlets where the walkways are outdoors, Concord Mills is actually like a regular indoor mall, but most of the clothing stores are factory outlets. There are also a number of non-outlet stores like Best Buy and TJ Maxx. I was hoping for some good sales during the holiday long weekend, but didn’t find anything too impressive. I did pick up a pair of loafers and some other small items though. That was it for my adventure to Charlotte. Since it’s not too far away, I think I’ll probably visit the city again, especially if I want to go watch a NBA or NFL game. Getting ready to race down the zip-lines. 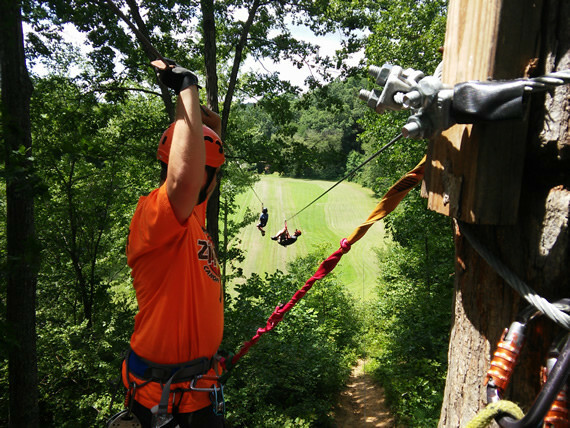 On another weekend, I went zip-lining with Carolina Zipline Canopy Tours, which is located near Hanging Rock State Park. I tried zip-lining 5 years ago in Whistler and it was loads of fun, so when I saw a Groupon deal for zip-lining I decided to give it a try. This zip-line experience was pretty fun too, although it wasn’t quite as impressive as the one in Whistler. The zip-lines weren’t as long, and the trees in North Carolina aren’t as tall as the ones on the west coast. On the other hand, this is less than half the prices, so it was still a good deal. On this tour, we went on around 10 zip-lines, the longest of which was 1000 feet. The set-up here is simpler than what I experienced up in Whistler, and the zip-liners had to do their own braking. The whole tour took about 2 hours, since there were 8 people in the group plus the guides, so everybody had to wait for their turns. After zip-lining, I visited Hanging Rock State Park once again. I visited the park in the fall of last year, but it’s a large park and there are still quite a few trails I haven’t hiked. This time I took the trail to Wolf Rock, and was treated to some gorgeous views. 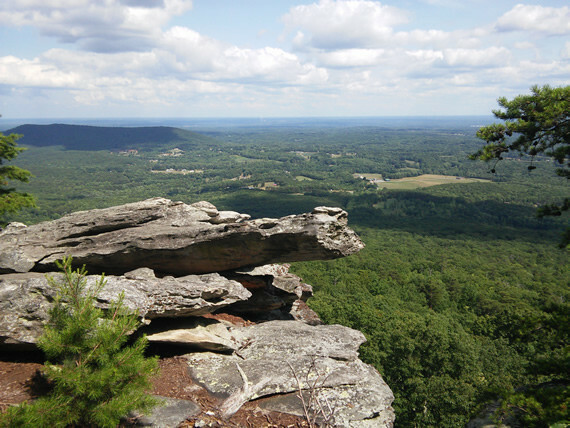 Hanging Rock is the closest location to Raleigh where one can get some nice elevated views. That’s all for this out and about round-up. I’m sure I’ll have more to share in a couple more weeks.